By using this practice book you can * become acquainted ... with the structure and types of questions on the GRE General Test. * familiarize yourself ... with the directions and answering procedures before you test. * review ... basic mathematical skills useful in the quantitative section. * practice ... with verbal and quantitative test questions and analytical writing topics chosen by the test maker. * compare your performance ... on each test question with the performance of students who took the tests when they were given at GRE test centers. Educational Testing Service is the world's largest private educational testing and measurement organization and a leader in educational research. The company is dedicated to serving the needs of individuals, educational institutions, and government bodies worldwide. ETS is best known as the developer of admissions testing programs for college and graduate study, including the College Board's SATR, the Test of English as a Foreign LanguageTM (TOEFLR), the Graduate Record ExaminationsR (GRER), and the Graduate Management Admission TestR (GMATR). 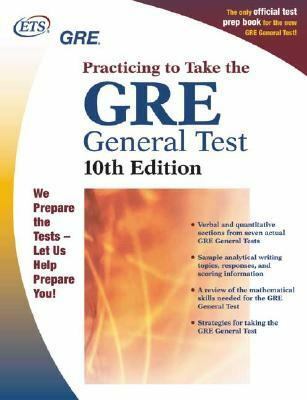 This book is published by Educational Testing Service for the Graduate Record Examinations Board, which is committed to serving those interested in graduate education.Gre Practicing to Take the General Test, 10 was published 2002 under ISBN 9780886852122 and ISBN 0886852129.